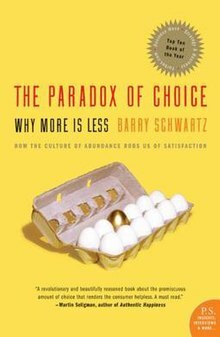 "The Paradox of Choice - Why More Is Less is a 2004 book by American psychologist Barry Schwartz. In the book, Schwartz argues that eliminating consumer choices can greatly reduce anxiety for shoppers. Autonomy and Freedom of choice are critical to our well being, and choice is critical to freedom and autonomy. Nonetheless, though modern Americans have more choice than any group of people ever has before, and thus, presumably, more freedom and autonomy, we don't seem to be benefiting from it psychologically."